Two Hundred Million Year-Old Lava Flow! Hiding deep in Mine Brook Park is a treasure waiting to be discovered! Approximately two hundred million years ago the rifting of Pangea spurred volcanic activity throughout New Jersey. Rock exposures along Walnut Brook tell a vicious story of Earth's trembling past. LOCATION: Walnut Brook across from Mine Brook Park, Flemington, New Jersey. ACCESSING THE TRAIL: A footpath, located across Capner Street, can be accessed through the paved parking lot on the north side of the park. The entrance to the footpath is just before the electrical transfer station adjacent to the Morales Nature Preserve. Once on the footpath, proceed north approximately 50 yards, until you see a path to the right angling down toward the brook. The exposures run north-south along the brook. Good luck! 200 MILLION YEAR-OLD LAVA FLOW? HOW DID THAT HAPPEN? Throughout the history of the planet, Earth's plates have merged together then split and drifted apart. This action is a byproduct of a well-known geologic theory called plate tectonics. This theory states that the Earth's surface is broken up into roughly 20 or so giant pieces of rigid crustal plates that carry the oceans and continents with them as they move slowly around the planet. About 220 million years ago, at the end of the Permian Period, all land on earth formed a supercontinent that geologists call Pangea. Cracking apart or "rifting" of Pangea began in the Late Triassic Period about 30 million years after the Permian. See Geologic Time Scale. As the North American Plate moved westward, separating from what is now Africa, volcanic activity deep in the earth was triggered and began the early steps that led to the formation of the Atlantic Ocean. The crust stretched and thinned as a huge plume of magma (molten rock) from the Earth's hot mantle began to rise and eventually erupted at the earth's surface as a lava flow. See The Breakup of Pangea. This lava cooled and solidified to form the igneous rock called basalt. Geologists refer to this basalt as the Orange Mountain Basalt. Can you imagine 200 million years ago, when dinosaurs roamed the earth, a huge surge of molten lava erupting from the ground engulfing all in its path? Well, get ready for it! 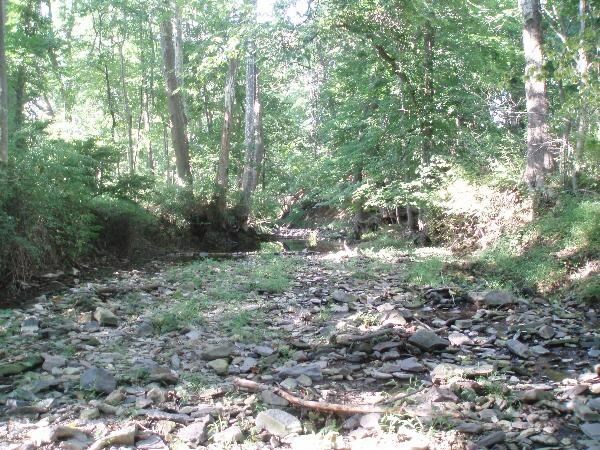 The eastern bank of Walnut Brook uncovers this very episode in Earth's past. There are sharp contacts (surfaces where two kinds of rocks meet) along Walnut Brook between the basalt and the older red shale of the Passaic Formation (fig. 1). The older red shale, indicative of lake sediment deposits will be discussed in greater detail later in the text. The basalt in the contact unconformably overlies this shale. An unconformity is a break in the geologic record, a time gap in the sequence of strata. In this case, the two different rock types are parallel and separated only by a small period of time. These unconformities not only reveal dramatic breaks in the rock sequence but also past geological events such as the rifting of Pangea. Figure 1. Outcrops along Walnut brook where the contact is exposed. The unconformity between the Passaic Formation and the Orange Mountain Basalt displays many interesting features. We'll show you three kinds of rock, local copper mineralization, veins filled with limestone, and basalt breccia. THREE ROCKS FOR THE PRICE OF ONE! The oldest rock unit is the brownish-red shale of the Passaic Formation. Shale is made from fine silt and clay particles that settled on the floor of shallow lakes and seas many years ago. Since the shale formed under compressive weight of the overlying sediments, it exhibits a flaky texture. Due to the tremendous heat caused by the magmatic intrusion, the shale closest to the magma underwent intense baking, which transformed it into a new fine-grained rock called hornfels. This effect, known as contact metamorphism, is an alteration in a body of rock caused by exposure to intruding magma. Lastly, the pride and joy of these events is the Orange Mountain Basalt, which is our well-known lava flow. Basalt is a very fine-grained rock, usually occurring in a black color. Conversely, this basalt has been weathered (altered by exposure to water and air) to reddish-orange. Figure 2. 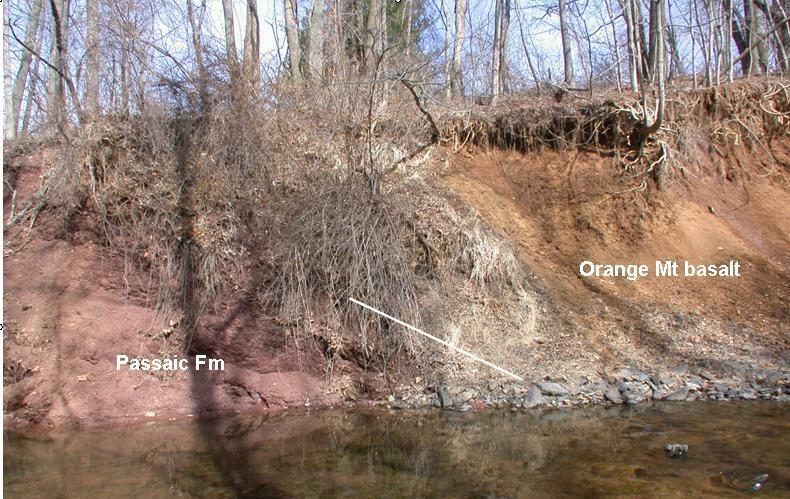 Unconformity between the Orange Mountain Basalt and the Passaic Formation shale. Across from the eastern bank is another unconformity, sometimes hidden beneath the overhanging banks of the stream near the footpath (fig. 3). 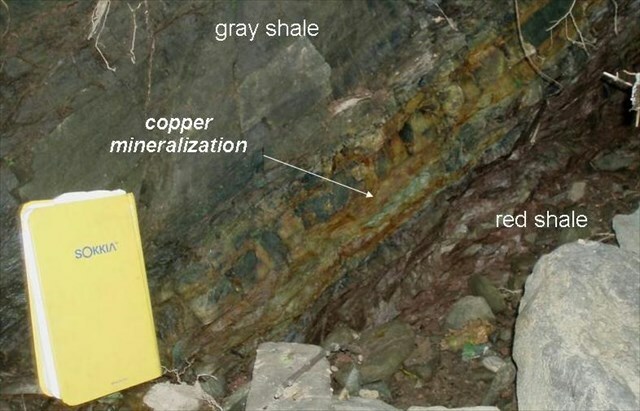 Here the contact includes a sequence of red and gray shale beds with the uppermost gray shale having copper mineralization (altered copper minerals) along its base, forming the copper carbonate mineral malachite. Malachite forms when carbonated water interacts with copper resulting in a bright green tarnish upon the rock surface. Since malachite's bright green color is so distinctive it is not difficult to identify the presence of copper ore deposits within the area. Flemington was the site of an early attempt to mine copper in New Jersey. Gordon’s History of New Jersey, published in 1824, says “A valuable deposit of copper ore is said to have been lately found near Flemington.” This copper mineralization is directly related to the copper mining industry in Flemington. Due to the green hue of malachite, miners recognized that copper existed in the area. It was one of the root causes that spurred interest in mining copper in New Jersey! Figure 3. Red and gray shale beds with some local copper mineralization. A fault zone is a "crack with movement" in the earth expressed as numerous small fractures. 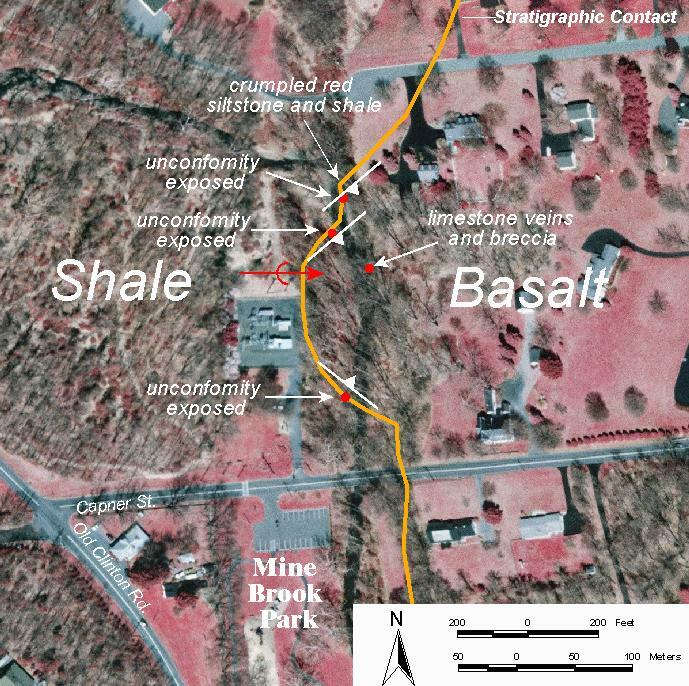 Mine Brook Park contains a variety of features that are commonly related to fault zones, such as breccia and mineralized veins. Breccia is a clastic rock (made up of preexisting rocks) composed of angular gravel-size fragments. In fault zones, one rock mass has slid past another, causing them to shatter and eventually form breccias. These rock fragments were caught up in "the mix" before there was time to round off any rough edges, which can be deduced from their jagged shape. This is a basalt breccia composed of chunks of basalt suspended in limestone cement (fig.4). Figure 4. Basalt breccia suspended in a limestone-like cement. It is extremely unusual to find basalt and limestone mingled together! One explanation for this is that the limestone originated from hot fluids circulating through the fault zone in an environment were hydrothermal activity existed, very similar to active hydrothermal deposits found in areas today like Yellowstone National Park. These hot fluids, rich in dissolved minerals, traveled along cracks in the rock and as they cooled the minerals crystallized and filled the gaps. This is reffered to as a hydrothermal vein deposit. 1. Describe the differences between the rocks of the Passaic Formation and the overlying Orange Mountain Basalt. You can start by describing the color variations and/or textural differences that distinguish them. 2. Find another location along the brook where the contact between the basalt and the red shale can be seen. Take a photo of yourself or your GPS receiver beside this contact. 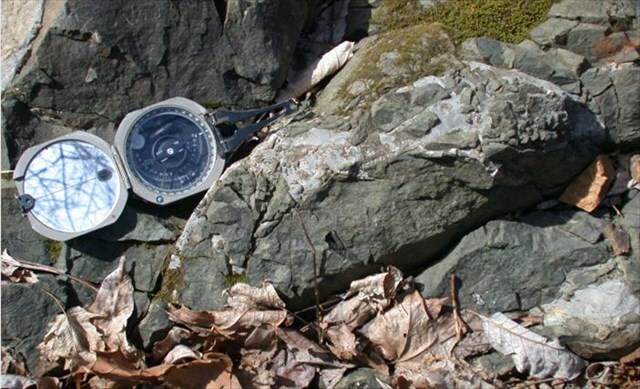 If you are unable to take a photo, record the GPS location of the unconformity and a brief summary of what you see. 3. Lastly, locate the exposure of the malachite within the red and gray shale unit and take a picture of yourself or your GPS receiver beside it. Herman, G. C., 2005, Stratigraphy and structure of the Passaic Formation and Orange Mountain Basalt at Mine Brook Park, Flemington, New Jersey: in Gates, A. E., editor, Newark Basin - View from the 21st Century, 22nd Annual Meeting of the Geological Association of New Jersey, College of New Jersey, Ewing, New Jersey, p. 134-144.
an agency of the New Jersey Department of Environmental Protection. Vs lbh ner univat gebhoyr svaqvat gur znva hapbasbezvgl, vg vf evtug npebff sebz gur cngu natyvat qbja gbjneq gur oebbx.